* opens with a very powerful story that nearly had me in tears on the train. Christian Moore writes movingly about his personal academic triumph despite his learning difficulties and being told he would never make much of his life. After yet another knock he picks himself up of the floor (literally) and gets on with proving his doubters wrong. This ability to keep going despite the difficulties is what Moores attempts to define and explain in his book. Street: the skills you get from hustling and grafting as Moores did as a child. Resource: the ability to be resilient because you have the resources available to help you overcome problems. Many project management setbacks can be resolved or alleviated with the right resources. Relational: where you draw your resilience from the fact that other people are relying on you, be that family or your project team. Rock bottom: where you hit rock bottom and have nowhere to go but up. Resilience, Moores says, “helps you cope with the day to day grind.” It helps you use all the No’s you hear as a reason to fight for a Yes. 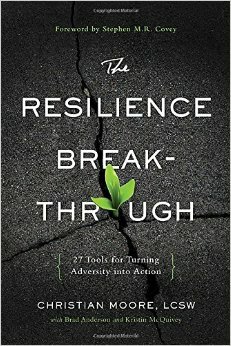 Moores believes that resilience can be taught although some people’s character leads them to handle situations in a naturally more resilient way. For example, having an open outlook on life can help, as can being authentic. This means that you don’t throw up walls and therefore feel more capable of dealing with difficulties in a way that is true to your personal style. Becoming more resilient, according to Moores, centres on being able to frame your problems differently and see issues from a number of perspectives. He talks about having a switch that you can flip to reframe a problem as a challenge or opportunity. He suggests that you practice using difficult situations to become better at focusing on doing the best you can instead of seeing them as a reason to give up. On a project, for example, you might see a communication breakdown as the opportunity to establish new communication channels instead of a failure. You can, of course, see the situation as both but the resilient project manager will learn from the experience and take the positives, moving past the difficulty. A less resilient project manager may wallow in the problem and do nothing to stop it from happening next time. Moores would be a great motivational speaker. This isn’t a project management book but if you are brushing up your soft skills then this is a good read and you’ll certainly take something from it. I did. * This article includes affiliate links at no cost to you.